Good morning from Tucson Arena on a spectacularly gorgeous day in Southern Arizona, and good morning first place, a position the Roadrunners have held since last Saturday’s 5-4 overtime victory over the Iowa Wild – albeit very early in the season, it’s a telling tale of the solid start the team has gotten off to thus far. 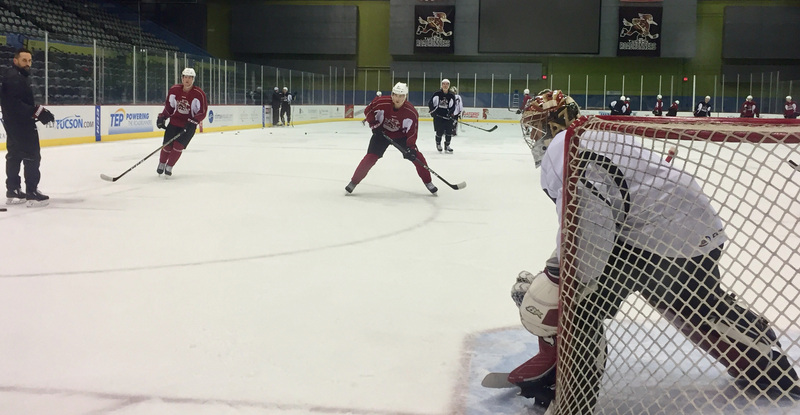 Welcome the Cleveland Monsters, who are getting a start on a four-game road trip. Tonight marks the first-ever meeting between the clubs. The Monsters enter the night with a 4-3-1-0 record. Cleveland will be the farthest team to have traveled to Tucson Arena for a game, totaling 2,007 miles from their home building, Quicken Loans Arena, trumping the Manitoba Moose’s 1,732 miles traveled last season from Winnipeg’s MTS Centre. 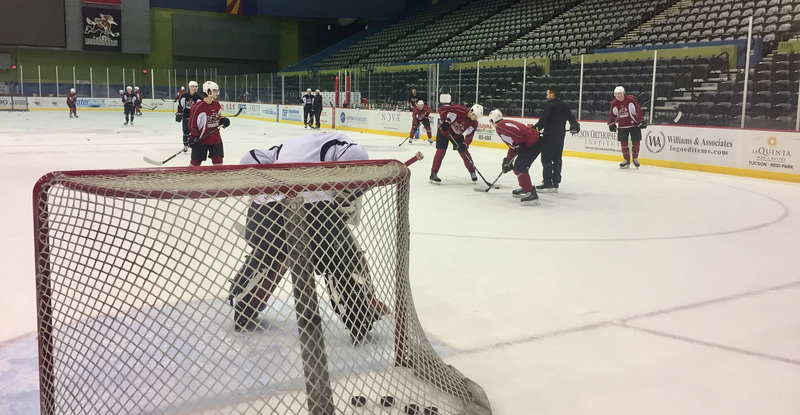 A near capacity morning skate for the club it was, a total of 22 players on the ice, including goaltenders Adin Hill, Hunter Miska, and Marek Langhamer. Adam Clendening, who’s assignment from Arizona was made official while the players were skating, was on the ice with the team this morning going through rotations with defensemen, wearing #4. The @ArizonaCoyotes have assigned defenseman Adam Clendening (@Clenny5) to the #Roadrunners. Clendening has played in 202 career American Hockey League games with the Rockford IceHogs, Utica Comets, and Wilkes-Barre/Scranton Penguins. He dressed in five games with the Coyotes this season. If Emerson Etem graces Mike Van Ryn’s lineup tonight, he will be playing in his 300th career professional game, a milestone that includes 173 NHL games. We’ve definitely had a good, full week of practice with a lot of focus. We want to play fast, and I think that’s what our practices have been all about, is fast movement. If you’ve watched our last two games, you’ll notice that they were really fast and upbeat and we were able to score a few goals. I think we just kept that focus in practice this week, and I think we’re going to bring it again this weekend. I think we just have a really good core of guys here. We want to win, we don’t want to lose. I remember last game we were down a couple of goals and we came into the third period and we were all together, and we knew we were going to win that game. I think it’s just a different mindset this year, and we want to be winners, we’re not accepting losing at all. It felt good. I think it had been a few games, so the monkey was off my back as I like to say, so that felt good and I think now the floodgates will be opened. They’re a good team, they’re fast. I think if we just stick to our game, we’ll have a solid weekend and come out with a couple of wins. More to come from a busy, busy game day in Tucson, Arizona.